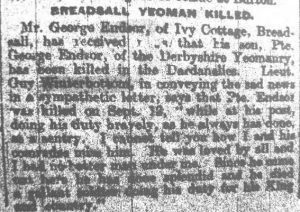 Mr George Endsor, of Ivy Cottage, Breadsall, has received news that his son, Pte George Endsor, of the Derbyshire Yeomanry, has been killed in the Dardenelles. Lieut. Guy Winterbottom, in conveying the sad news in a sympathetic letter, says that Pte Endsor was killed on Sept. 12, ” while at his post doing his duty bravely, as he always has done as a sentry. I cannot tell you how I and his comrades miss him. He was loved by all and I had no better man under me. Since he came out here he has done splendid and he died a gallant soldier doing his duty for his King and Country. The accompanying photographs are of two gallant local soldiers who have been killed in battle. Pte. Geo. 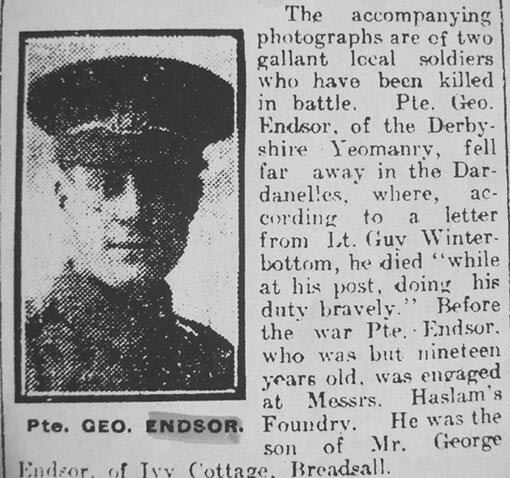 Endsor, of the Derbyshire Yeomanry, fell far away in the Dardanelles, where, according to a letter from Lt. Guy Winterbottom, he died “while at his post, doing his duty bravely.” Before the war Pte. Endsor, who was but nineteen years old, was engaged at Messrs. Haslam’s Foundry. 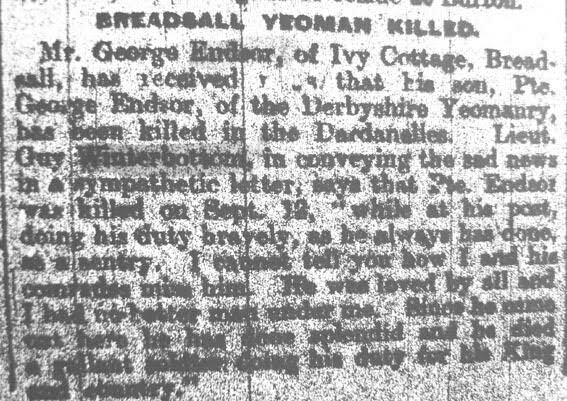 He was the son of Mr. George Endsor, of Ivy Cottage, Breadsall. You will see a reference to Haslam’s foundry. That was possibly on Haslams Lane Derby ? Owned by Sir Alfred Seale Haslam of Breadsall Priory ? whose son William Kenneth Seale also died and is shown on the church memorial. Pte. W. H. Langford, for ten years in the Great Northern Railway service, obtained an appointment at the Royal Colonial Institute in February, 1913. He joined the Public Schools Regiment in May, 1915, and accompanied his regiment to France in November of the same year. 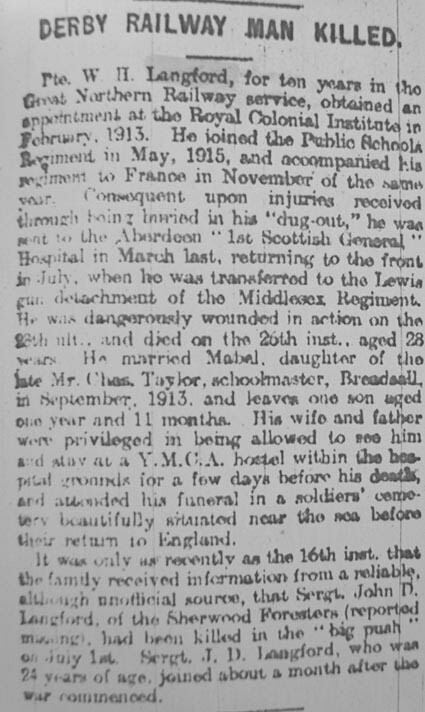 Consequent upon injuries received through being buried in his “dug-out,” he was sent to the Aberdeen “1st Scottish General” Hospital in March last, returning to the front in July, when he was transferred to the Lewis gun detachment of the Middlesex Regiment. He was dangerously wounded in action on the 28th ult. and died on the 26th inst,, aged 28 years. He married Mabel, daughter of the late Mr. Chas. Taylor, schoolmaster, Breadsall, in September 1913, and leaves one son aged one year and 11 months. His wife and father were privileged in being allowed to see him and stay at a Y.M.C.A. hostel within the hospital grounds for a few days before his death, and attended his funeral in a soldiers’ cemetry beautifully situated near the sea before their return to England. It was only as recently as the 16th inst. that the family received information from a reliable, although unofficial source, that Sergt. John D. Langford, of the Sherwood Foresters (reported missing). had been killed in the “big push” on July 1st. Sergt. J.D. Langford, who was 24 years of age, joined about a month after the war commenced. 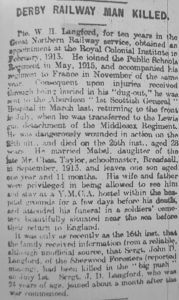 Died of Wounds on the 20th November 1916 which is 6 days earlier than the date on the below article and given on Commonwealth War Graves website at http://www.cwgc.org/search/casualty_details.aspx?casualty=503088 but I believe the above article is relevant. The parents of Pte. Thomas Henry Hopkins, of the Sherwood Foresters, have just been officially informed that their son was killed in action on or shortly after Sept. 26. He had previously been reported missing, and in reply to his parents’ anxious enquiries the above distressing information was received. Private Hopkins was a very popular lad in his native village of Breadsall. where. before he was called up, he was employed on one of the farms. When the Home Guard movement started he was a very enthusiastic member of the Breadsall Corps. He was also one of the most efficient of the Breadsall Church bellringers, which band of ringers was only inaugurated in September 1916. He was called up for military service in March, and after a brief training was sent by the military authorities to help a Westmoreland farmer with his crops. In July he was sent out to France, where he met a hero’s death two months later. He was not yet 20 years old, and his premature death is greatly regretted by all in his native village, and the deepest sympathy is extended to his parents, who will feel his loss very severely, as he was the oldest of a very large family. He was greatly liked by all he came in contact with, whether in private life or in the Army, and he will be greatly missed as he was a good son and a great friend. the late M. H. Lemon. Grave/Memorial Reference: Pier and Face 11 A and 11 D.
Grave/Memorial Reference: Pier and Face 11 C.